Holy smokes you guys! I just realized that it's been since August when I last showed you an FO. Really? How could that even be?? I know that I've finished a few things over the past couple months. Man, I've been really slacking off! Yikes! So to make up for it, I give you one of the newest things to fall off the needles. Ok, it actually fell off last month. I've just been having a hard time trying to get both Brett and the Munchkin together to take photos...and when they are together, it's a bit hard to get them to stand still long enough to snap a few decent photos. So please excuse the lack of photos...these were the best of the bunch...and trust me, I took a ton. The Munchkin kept running off and Brett was constantly making faces (and since the Munchkin takes after him so much, I have a feeling all future family photos and whatnot will be of him making faces too). Le sigh. That's life for you! Our complex is being painted...so please don't mind the painting randomness! 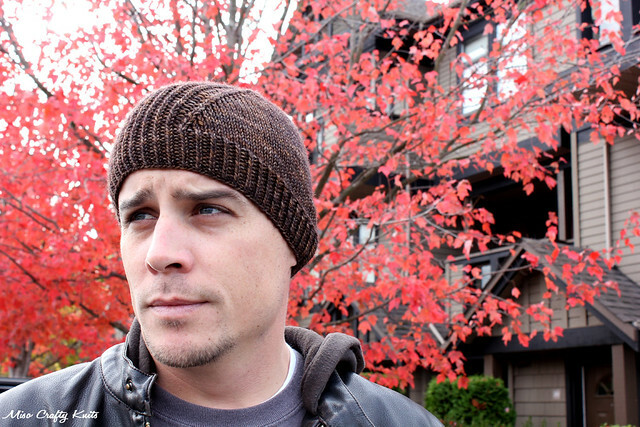 Anyhoo, I give you the first FO of the fall/winter season: the Windschief hat by Stephen West. 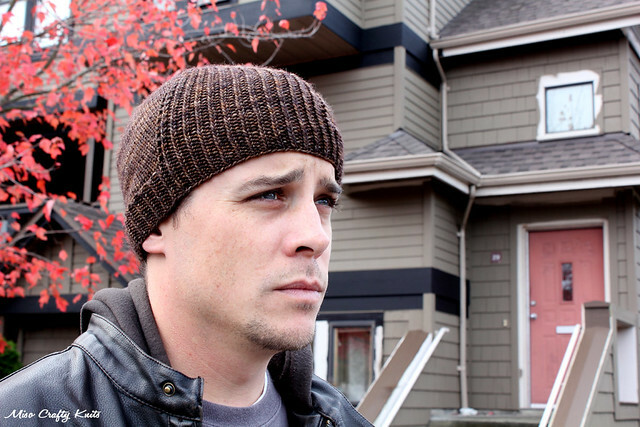 Last month when the weather went from unseasonably warm to fall crispiness over night, I realized that the Munchkin didn't really have a warm hat that fit him and I didn't like the one that Brett was wearing. When I went to Knit City I had picked up a gorgeous skein of Madelinetosh in one of Brett's favourite colours - brown, with the full intent of knitting him a hat with it (obviously, since I bought it in a colour he would like). After showing him pretty much every.single.hat.pattern in the Ravelry databases (and Brett not liking all but 3 patterns) I finally got to cast on Windschief. I'm going to 'fess up and admit that I didn't do a gauge swatch (cause really, by the time I finish knitting a swatch the hat could have been half knit already...wouldn't you agree? ), even though I was a little nervous that since I was using a DK weight for a pattern that called for a worsted, and that Brett has an abnormally large head, and did I mention that I checked out all project pages on Ravelry for those who used a DK weight yarn to see what needle size they used and therefore based what size I should use on a generalization? Yeah...living on the edge...that's how I roll. Luck was definitely on my side for this project cause in the end the hat fits Brett perfectly! Phew!! This pattern is seriously such a joy to knit. Normally I would groan at the twisted rib, but since I'm using a yarn thicker than a sock weight AND I was knitting in the round, the twisted rib was actually really nice to knit. A bonus: this pattern worked up quick. As in I managed to whip up this hat in a day. Mind you, I was relentless and had knit on it every spare second. Literally. I was knitting on it in the truck as we took a leisure drive, I was knitting on it in the lineup at the coffee shop, I was knitting on it at the playground...heck, I even snuck in a few stitches as I walked from the passenger side of the truck to the back where the Munchkin was buckled in. I didn't make a single mod and ended up using a smidge over half the skein, plenty left over to knit up a matching hat for the Munchkin! See this photo? That's how it goes when it comes to taking photos of the Munchkin! So the second I bound off and wove in the ends of Brett's hat I had immediately cast on the small size for the Munchkin. Aside from shortening the height of the hat, I had knit the small as per instructed in the pattern and still ended up with a fair bit of yarn leftover! And just like Dad's hat, the Munchkin's hat took less than a day to whip up too. Sweet! At first I thought I would have to fight the kiddo to get him to even wear it, but after seeing Brett sport his hat, the Munchkin was more than willing to wear his! Oh, the joy that bursts from my heart to see him wear his Mommy-made hat...it brings tears to my eyes. Even more so when I ask him to grab a hat as we head out the door that he runs and grabs this hat. Eek! 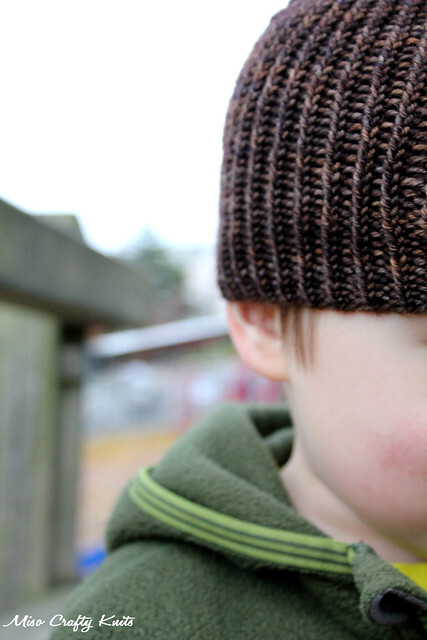 This hat is totally a gateway knit that will make the Munchkin want to wear Mommy-made handknits all the time!!! Ok, maybe not all the time, just...more. This is one of the weird looks that Brett kept giving me every time I tried to take a photo him and the Munchkin. Goofball! I'm mega pleased with how these hats turned out and so proud of myself for picking a colour that suits both Brett and the kidlet. I'm also really glad that I used Madelinetosh Tosh DK for them too, cause not only is the yarn a sheer joy to knit with, but it also gives beautiful stitch definition - which is what this design is all about. I think the depth and tonal hues within the colourway really made the twisted rib pop! Laughing it up...the Munchkin loves his Daddy-time! Great hats, and what an adorable family! 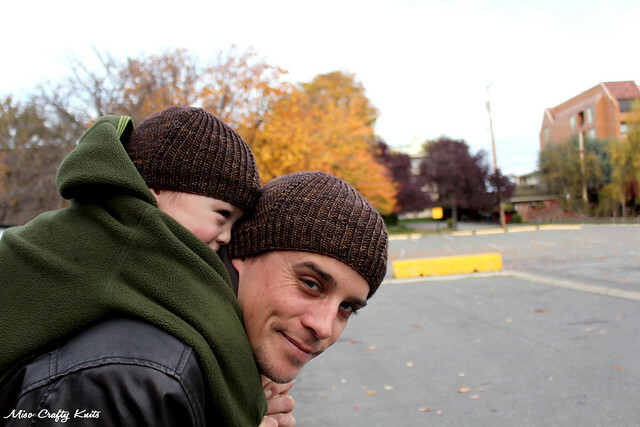 What great father/son hats! That is a really lovely shade of brown and both hats look perfect. Guys are so hard to get photo's of aren't they!? My hubby is the same, he never smiles for the camera. You managed to get some great shots nonetheless! aww how cute is that first photo! Love the hats. Thanks Kat, I have to say that was one of the most candid shots of the two and probably my most favourite to date! awesome pictures, love your family. and great hats too! 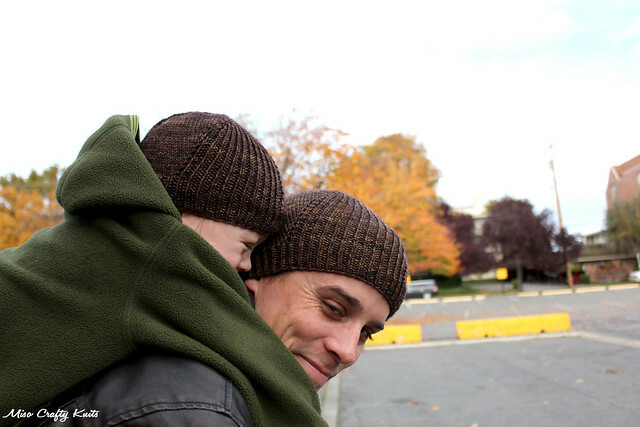 Awesome father-son hats! That colorway is just gorgeous. Thanks so much Preeti!! :) I fear my photos don't actually do the colour of the yarn any justice!